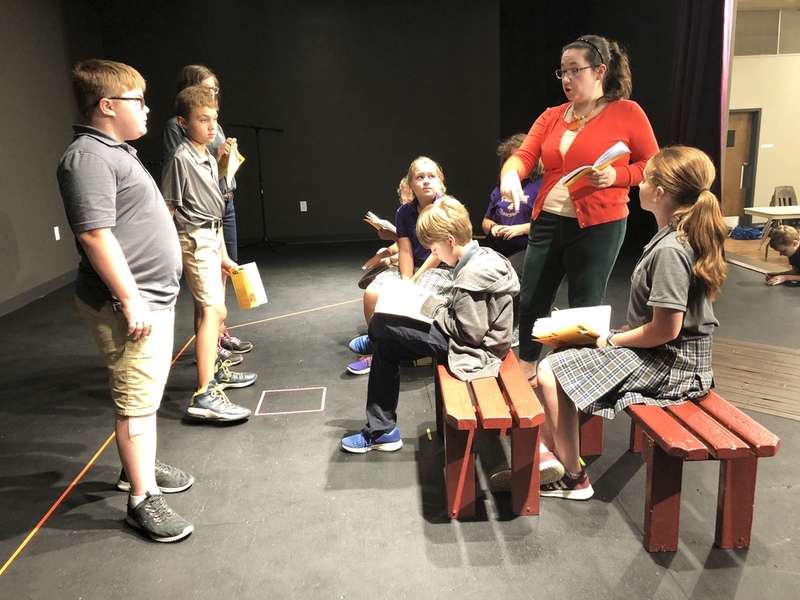 Director Rosalyn Williams is seen practicing Tuesday with members of the Middle School Drama Club on the Spiritan Center stage for their upcoming production of "Sally Cotter and the Censored Stone" by Dean O'Carroll. It's a comic parody of the Harry Potter stories being presented October 12, 13 and 14 through an Art Rajin' Cajun grant. The cast includes: Isabelle Garrett. Max Gilbert, Ava Piraino, Olivia Keisling, Amelia Erstine, Kayden Kordsmeier, Sophia Scholz, Addison Choate, Richard Rappold, Cherokee Jones, Ann Harvey, Ethan Loynachan, Jillian O'Dwyer, Aiden White, Anneke McGhee, and Josie Jackson.